Froelich’s Ladder delights with its wit and imagination. 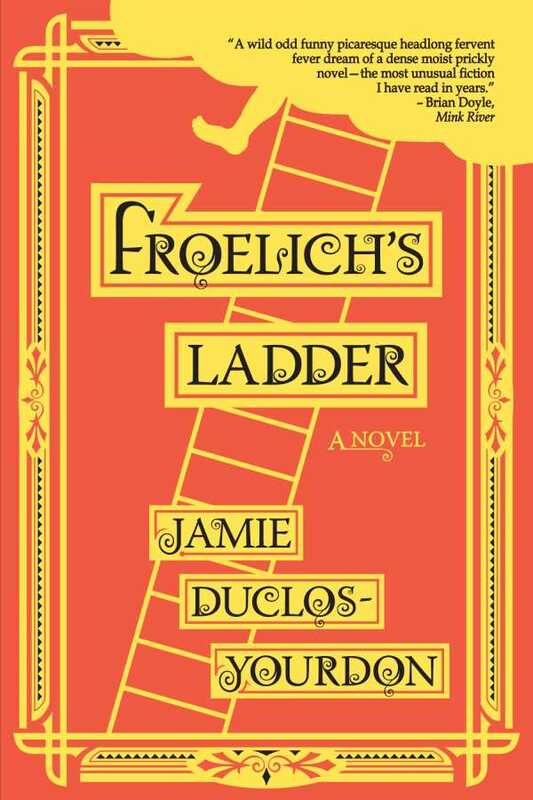 Bristling with the bizarre, Jamie Duclos-Yourdon’s Froelich’s Ladder is a fantastical commentary on humanity’s interconnectedness. Wrapped in the trappings of American tall tales and fairy tales, the promise of the American frontier beckons German immigrants Froelich and his brother, Harald. Together, they acquire land in Oregon and soon discover the Very Big Tree. While Harald sees only a tree, the visionary Froelich sees the tallest ladder in the world. The brothers’ amiable partnership is torn asunder when Harald takes Froelich’s love interest for his wife and fathers two children. Froelich shuts himself away from the world by choosing to inhabit the highest rungs of the ladder, communicating via a language modeled on Morse code. Years pass, and Harald and his wife pass on, leaving their two children, Gordy and Binx, to tend to the ladder alone. When Froelich goes missing, Gordy ascends the ladder to look for him, but falls and meets Gak, a girl pretending to be a boy. Their search for Gordy’s uncle is fraught with Confederates, a businessman, and other European immigrants, all of whose actions converge in a climax that reinforces community over isolation. The Oregon of the novel is seen at once as beautiful and grotesque as characters, some more transient than others, flit in and out of scenes. Gruesome murders and squalid living conditions are juxtaposed with a dreamlike journey in a hungry cloud and a game of bowling. The surreal and sometimes disjointed nature of the narrative is reminiscent of Wonderland, and adds another dimension of alienation to the narrative, even as the characters wrestle internally with their own. The ladder itself proves to be both a boon and a burden, especially to Harald and then Binx, who both serve as human supports. Though it provides an avenue of communication with Froelich, it is also something that must be cast off in order to achieve true and lasting freedom. And yet, though Harald had constructed a fulcrum, neither he nor Binx elect to use it until one of the story’s most emotional scenes. Froelich’s Ladder delights with its wit and imagination, resulting in a poignant yarn spun to assure us that we are not alone.